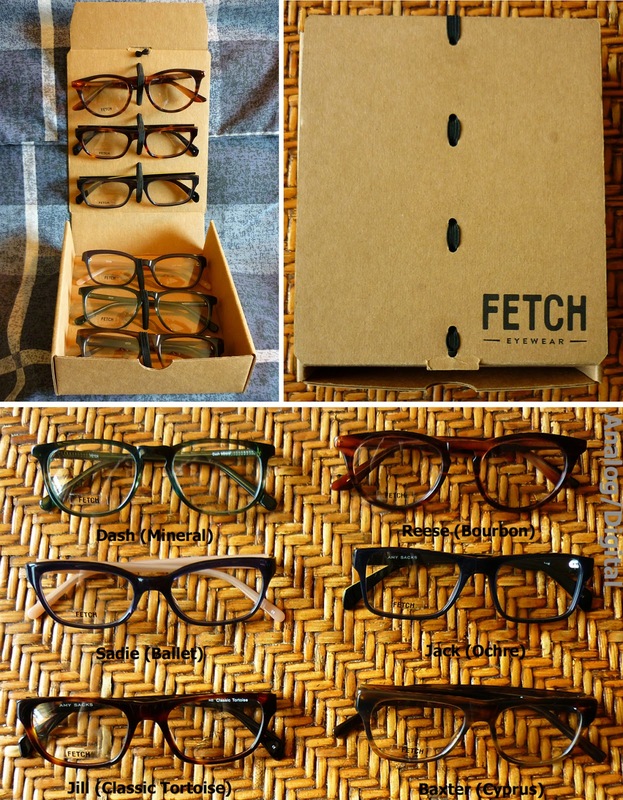 Fetch Eyewear is the latest in my review series of online eyeglass retailers focusing on predominately online stores that offer a limited range of designer frames, at-home trials, a risk-free returns policy, free shipping both ways and charitable programs, all at a price point of around $100 (or $125 for high indexes). I'm not out to find the cheapest possible glasses, but the best value for money and most safe/reliable companies to buy from. You can view the full series of reviews to date here. Fetch kindly opted to take part in this series by providing me with a pair of high index sunglasses, making them the seventh company that I have reviewed since I first started shopping for glasses online last year. 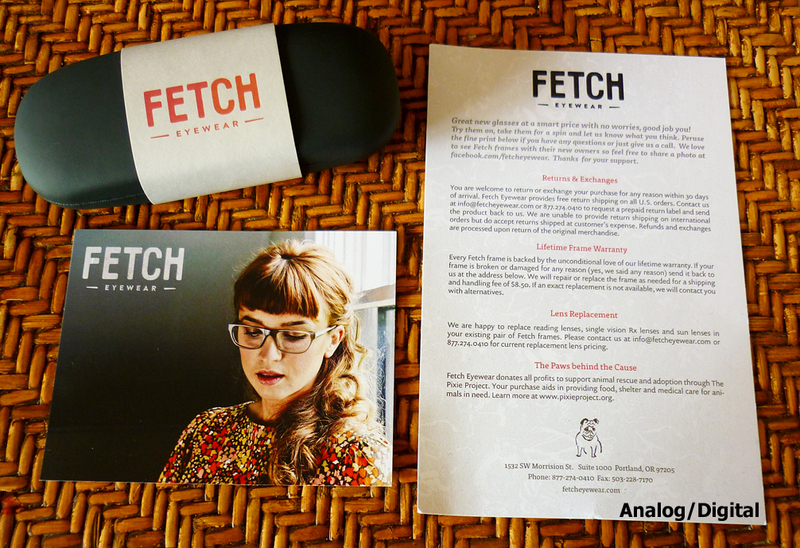 Fetch reflects the belief that fashion is nothing without compassion. Our frames stand on their own based on high-quality optical materials, but they also appeal to the socially conscious consumer who wants to get involved and give back. Doing good while looking good is something we can all get behind, and this is certainly the most generous contribution among the companies I've reviewed so far. The Fetch website is modern and attractive. It is easy to navigate and to find all the information you need about glasses, lenses and guarantees, as well as the charitable program which is prominently announced on the front page alongside photos of loveable animals from the Pixie Project. The main navigation sorts frames by gender, then by type: "reading", "prescription" and "sunglasses". After you choose the type of glasses you're looking for, you can helpfully sort them by frame color, shape, size and face shape and even adjust the layout of the results. It's very easy to choose the frame color and lens type options you want from the individual item pages, so even if you're browsing under "reading", one click will take you to "sunglass" options. Each frame page also offers a description of the style, views from a couple of angles, available color options, the measurements, a photo of a model/models wearing the glasses, and a guide to the fit. There are two things in particular which stand out to me about the Fetch website compared with others. One is the "find your fit" feature. There several useful and extensive guides for choosing the best frame to fit your skin/eye/hair tone and face shape. Fetch goes well above and beyond other guides like these, especially with the skin tone and hair color suggestions that point to a more fashion-minded aesthetic as is also reflected in the design of the glasses themselves (more on that below). You can read about the design process behind the making of Fetch frames here. For day to day lens care, use the cleaning cloth included with your glasses. This cloth is ideal for removing fingerprints and smudges without damaging the lenses. Fight the temptation to use shirttails, paper towels or tissue to wipe lenses as the fibers may scratch the lens surface. To remove surface dirt, run the lenses under lukewarm water and gently rub the surface with your fingers. After the dirt is dislodged, pat dry with a soft cotton cloth and follow up with the lens cloth. Let's compare this to the cringeworthy instructions from Warby Parker: "To thoroughly clean your lenses, simply rinse them with lukewarm soap and water, and dry them with a paper towel." Never do this! These days most glasses websites look more or less the same, but I have to give credit to the web architects for Fetch because the design is simple, yet unique enough to communicate the brand and aesthetic. At the time of writing, I counted around 25 different frame styles on the Fetch website, but many these come in multiple colors. The frames themselves certainly benefit from Ann Sack's modern and sleek design sensibilities. Because they are all in-house designs, there are unique styles that you won't find elsewhere. Browsing through the selection of frame styles on the website, I was impressed by the variety of shapes, colors and sizes. There are really no frames that I thought were garish or ugly, which is always a good sign for me of the time and effort that is put into making the collection cohesive and appealing for most customers. The collection boasts frames constructed of cellulose acetate and/or sustainable massa bamboo (select styles) with stainless steel rivets and three or five barrel fixed hinges. They don't offer flex/spring hinges because they do not meet Fetch's standards for withstanding wear and tear. Anyone who has traditionally worn spring hinges might question this, but a lot of the latest designer glasses in big name brands use cheap spring hinges now that don't last as well as they used to. Conversely, I haven't had any problems with fixed hinges on acetate glasses that I've ordered online. Spring hinges do adjust for a more comfortable fit with less hassle, so that may be a trade-off to consider if you tend to need adjustments and, like me, do not have a trustworthy local optician. However, Fetch Eyewear's warranty includes this especially generous clause: "Your lifetime warranty covers any frame damage caused by third party adjustments." That is reassuring given that I have previously had local opticians mess up my glasses during a routine adjustment and even break a frame that I had ordered online. Reading glasses with lenses or frame-only (no lenses) cost $85. Prescription glasses cost $125 with standard CR-39 plastic lenses and there is a $40 bump for high-index 1.67 lenses, making that $165. You can order six pairs of Amy Sacks-branded designer frames from Fetch Eyewear to try on at home before you decide which ones to purchase. I had a hard time narrowing down my choices, mostly because all of the frames come in a variety of great colors. The one that I was most excited to try was Dash in Mineral. My home trial arrived within a few days of ordering, which is not bad considering it came from Oregon to New York. I had special ordered Sadie in Ballet via email, but this frame was sadly not included in the trial box when it arrived with one empty slot. I got back in touch with customer support and they sent out the missing frames right away so I was able to try out all six together. The home trial frames are secured by an elastic band to the interior of a brown cardboard box as opposed to the black cloth presentation boxes that come from other companies. I like the simplicity of the box and its eco-friendliness. However, the elastic bands make it a little difficult to get the frames in and out easily. The glasses did not come packaged in any plastic bags or covered in any way other than the folding box (see photos). As a result, the trial frames I received were covered in a lot of smudges and fingerprints. Some had dust and hair on them and they really needed to be cleaned before I tried them on. One or two were crooked from multiple trials. Only the Sadie frames arrived brand new. I don't have a problem with trial frames getting sent around a lot – I mean, that's what they're for. I always clean mine before I send them back as a common courtesy, even though I assume the company selling them is going to clean them up and repackage them for the next customer. So it was a little disappointing to see that no effort had gone into that. I started by trying Dash in Mineral. I loved the shape and color in person just as much as on the website. Alas, they were too big for my face. I kept them on my short list up until the last day before ordering, but had to face the fact that they just didn't fit right. I thought Reese were going to be strong contenders, but they were thicker and more pointy at the temples than I wanted. The bourbon color was very pretty, though. Sadie in Ballet were probably the most feminine in shape in the set and Jack in Ocre the most masculine. I liked them both a lot, but one issue that is worth mentioning is the color of these frames is not true to what is presented on the website. The stems of the Jack glasses look like a deep olive green on the website, but turn out to be a bright lime green in person. Similarly, Sadie in Ballet looks like it has wood-toned stems, but in person these are flesh-colored and actually too close to my skin tone for comfort. For these reasons, I had to reject them both to my dismay. Lastly, Jill in Tortoise and Baxter in Cyprus were very similar frames in style and even color, only Baxter sport thicker stems and a duller finish. The Baxter trial frames were also a little tight on me. I finally decided on Jill in Tortoise with gray tinted sun lenses. This actually surprised me, as the Jill frames are featured on a model throughout the website and I didn't think they would look right on me. It turns out they really suit me, so another thumbs up for home trials! My order arrived in a couple of weeks. The glasses were very well packed and presented on arrival, complete with a friendly note card, warranty, refund policy, background information about Fetch, and a branded cleaning cloth with an adorable cat on it. 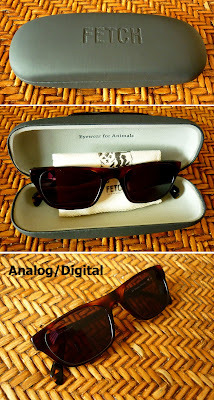 The charcoal gray case is lightweight, but sturdy, and reads "Eyewear for Animals" inside. 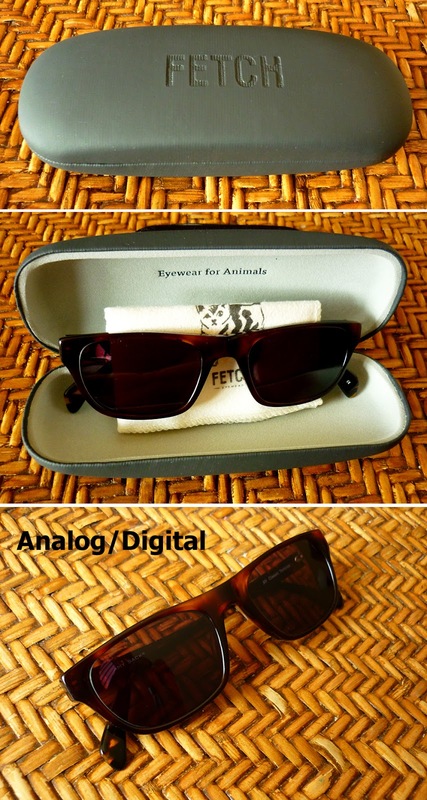 I am very impressed by the quality of both the frames and the lenses provided by Fetch. My new Rx sunglasses arrived in pristine condition and were ready to wear with no adjustments necessary. The frames are a beautiful, warm tortoise brown polished to a perfect shine that really compliments the Jill's classic style with a feminine twist. With their rounded edges and mid-weight stems, I can see these glasses being a perfect fit for both petite and larger faces. On me they are fairly bold and give me great coverage in the sun. My husband has remarked that they are his favorite out of all my glasses. On top of their appearance, the build quality and sturdy and secure hinges make them feel like a solid pair of glasses that will last a long time. The 1.67-index lenses in my strong Rx fit perfectly inside the frame with only a little sticking out on the one lens that it slightly stronger. I consider that an ideal fit because the frames are still feminine and not clunky, but contain the lenses securely. They don't make the frame feel too heavy at the front as is prone to happen with high index lenses in higher prescriptions, either. The prescription itself is just right and my vision is excellent. The lenses arrived spotlessly clean, which is always great because there's nothing worse than having to wipe down a new pair of glasses before you even wear them. I requested a gray tint for the Rx sunglass lenses. The first thing that I noticed, compared with my Eyefly sunglasses is that the color of the tint was more of a warm, champagne-ish gray rather than a cold gray. For photographic purposes, it is ideal to have a cool gray because this will keep the truest colors outdoors. The difference is hardly noticeable when I hold them up to the light, so I would put it down to the fact that they are actually a darker, stronger tint in general and that's a good thing. I am thrilled with the sun lenses and the protection they provide. On very bright days, such as walking around NYC in the summer, they are just right. 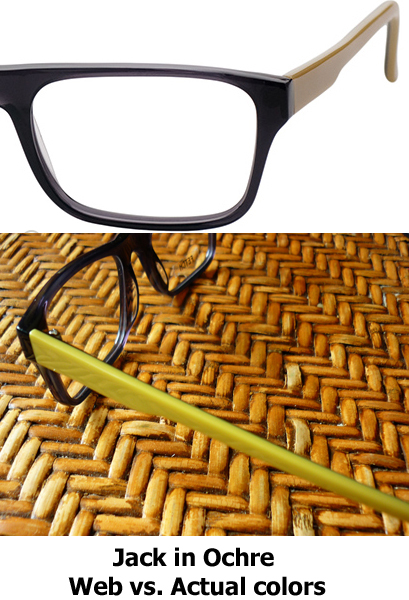 Fetch Eyewear glasses are of outstanding quality and very reasonably priced even for high indexes. On top of that, the designer background of Ann Sacks results in some standout frame options you won't find elsewhere and also allows Fetch to offer an unmatched 100% charity program for animal rescue. While my home trial could have been improved, Fetch got it right where it counts the most: in customer service and in delivering a stunning pair of glasses. Don't forget to check out their website giveaways and sale frames for great deals. 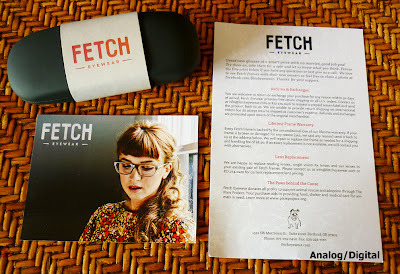 My reviews up until now have been predominantly focused on local NYC companies, making Fetch Eyewear the first West Coast representative in this series. I am happy to report that I had a smooth and seamless experience with Fetch Eyewear, attesting to great customer service in online eyewear coast-to-coast. Were the frames you got made in the US or China? It doesn't actually say on the frames where they were manufactured. However, this is from the Fetch website: "​Fetch frames are assembled and hand finished in China by a small manufacturer renowned for their quality and innovation."